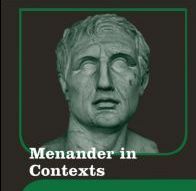 Just to mention that two books of mine about Menander are due to appear in the next few weeks. with introduction and commentary – the first edition of a play of Menander (or indeed of any text that has survived only in papyri) in the Cambridge Greek and Latin Classics series (commonly called the “green-and-yellows”, though my eye sees them as two-tone green). The other (pictured), about which I have written here before, is a multi-author volume called Menander in Contexts, containing sixteen papers examining the relationships between Menander’s comedies and a range of literary, social and philosophical “contexts”, from fifth-century Athenian tragedy to The Importance of Being Earnest, and from Aristotle to Zeno. Both will be out before the end of the year. and how much will the price of the book? … and where I buy it .. I can pay with bitcoin?